As your child ages past the newborn and young baby phase, sleep safety needs change. Though many "back to sleep" rules still apply, when should you introduce a pillow? Switch to a toddler bed? Read on to see how to keep your active, older baby safe while sleeping. Safe to Sleep is the organization that started the Back to Sleep campaign 20 years ago. A dramatic decline in Sudden Infant Death Syndrome deaths has been noted in all nations where the campaign has been advertised. Although after one year of age SIDS is no longer a risk, do your best to continue to put them to sleep on their backs--knowing they'll probably roll on to their tummy and that's OK. When your baby is mobile enough that he can roll from front to back on his own—usually between four and six months old—it's OK to leave him on his tummy if he rolls over in his sleep. You still need to ensure that you're putting him down on his back, but there's no need to risk waking him up to roll him over. When your baby becomes at all mobile, lower the crib. When baby can roll over, lower the crib one level. Lower it again when baby can sit up or starts to crawl. 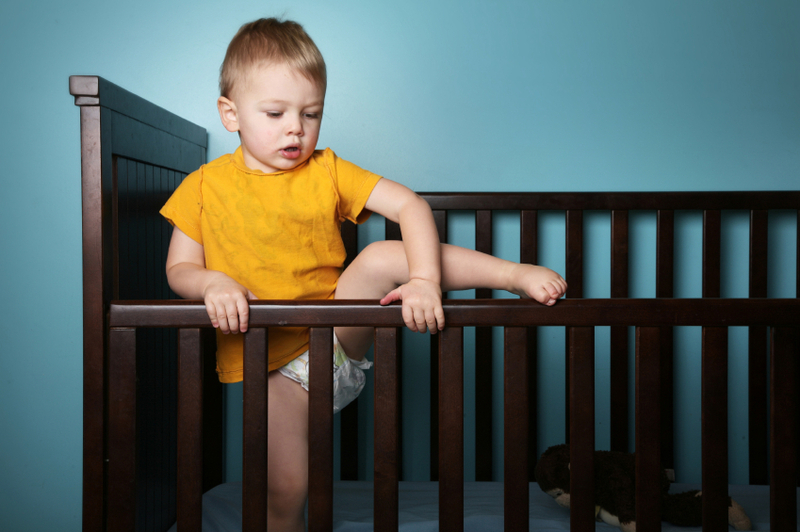 When baby can pull up, put the crib at its lowest level to prevent accidental falls out of the crib. It's always safest to err on the side of the mattress being too low than too high. Vincent Iannelli, MD told About.com that bumpers are no longer recommended for use. If you have used them, even if they are the breathable style, you need to remove bumpers when baby can pull up so that she can't step on them to assist in a potential crib escape. While you should try to keep your baby in his crib for as long as possible, when he's old enough to stand up and show interest in climbing out of his crib, it's time to switch to a bed. Experts say this can often happen between 18-24 months of age—although that's just a guideline. Since every child is different, watch your baby's activities and make the move when he's ready. Although it's easy to assume that your baby will be uncomfortable without a pillow, she's actually doing just fine. It's best to never use a pillow in a crib, but when your baby switches to a bed it's OK to offer a small, firm pillow. When your baby is finally in a bed of his own, you need to be certain that his room is safe in case he has a midnight adventure. All outlets should have plug guards, all window shades should have long strings shortened or removed to avoid strangulation, furniture like dressers or changing tables should be strapped to the wall, and any choking hazards or other unsafe objects should be removed from the room. To avoid the chance that you baby can have an adventure around the house while you're sleeping, confine her to her room at night by putting a baby gate at her door. While many older babies are able to sleep through most nights, there are always exceptions. It's best to be prepared every night to avoid any bedroom escapes.